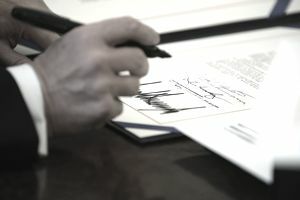 On December 22, 2017, President Trump signed the Tax Cuts and Jobs Act. It cuts individual income tax rates, doubles the standard deduction, and eliminates personal exemptions. The top individual tax rate drops to 37%. The Act created the following chart. The highest tax bracket is $500,000 for single people and $600,000 for married couples. Beginning in 2018, they pay a 37% rate after exemptions and deductions. That's lower than the 2017 rate of 39.6%. A single filer's deduction increases from $6,350 to $12,000. The deduction for married and joint filers increases from $12,700 to $24,000. It reverts back to the current level in 2026. It's estimated that 94% of taxpayers will take the standard deduction. That will save them time in preparing their taxes. The Act eliminates most itemized deductions. That includes moving expenses, except for active-duty members of the military. Those paying alimony can no longer deduct it while those receiving it can. This change is effective for divorces signed in 2018. It keeps deductions for retirement savings, and student loan interest. It also allows those age 70½ or older to directly transfer up to $100,000 a year to qualified charities from their individual retirement account. This transfer counts toward the taxpayer’s required minimum distribution for the year but isn’t included in the taxpayer’s adjusted gross income. The Act limits the deduction on mortgage interest to the first $750,000 of the loan. Interest on home equity lines of credit can no longer be deducted. Current mortgage holders aren't affected. The Act expanded the deduction for medical expenses for 2017 and 2018. It allowed taxpayers to deduct medical expenses that are 7.5% or more of income. Before the bill, the cutoff was 10%. Seniors already had the 7.5% cutoff. At least 8.8 million people used the deduction in 2015. The Act lowers the maximum corporate tax rate from 35% to 21%, the lowest since 1939. The United States has one of the highest rates in the world. But most corporations don't pay the top rate. On average, the effective rate is 18%. Large corporations have tax attorneys who help them avoid paying more. It offers a 20% standard deduction on qualified income for pass-through businesses. This deduction ends after 2025. Pass-through businesses include sole proprietorships, partnerships, limited liability companies, and S corporations. They also include real estate companies, hedge funds, and private equity funds. The deductions phase out for service professionals once their income reaches $157,500 for singles and $315,000 for joint filers. The Act limits corporations' ability to deduct interest expense to 30% of income. For the first four years, income is based on EBITDA. This acronym refers to earnings before interest, tax, depreciation, and amortization. Starting in the fifth year, it's based on earnings before interest and taxes. That makes it more expensive for financial firms to borrow. Companies would be less likely to issue bonds and buy back their stock. Stock prices could fall. But the limit generates revenue to pay for other tax breaks. The Act stiffens the requirements on carried interest profits. Carried interest is taxed at 23.8% instead of the top 39.6% income rate. Firms must hold assets for a year to qualify for the lower rate. The Act extends that requirement to three years. That might hurt hedge funds that tend to trade frequently. It would not affect private equity funds that hold on to assets for around five years. The change would raise $1.2 billion in revenue. It cuts deductions for client entertainment from 50% to zero. It retained the 50% deduction for client meals. The Act eliminates the corporate AMT. The corporate alternative minimum tax had a 20% tax rate that kicked in if tax credits pushed a firm's effective tax rate below 20%. Under the AMT, companies could not deduct research and development spending or investments in a low-income neighborhood. Elimination of the corporate AMT adds $40 billion to the deficit. The Act allows companies to repatriate the $2.6 trillion they hold in foreign cash stockpiles. They pay a one-time tax rate of 15.5% on cash and 8% on equipment. The Congressional Research Service found that a similar 2004 tax holiday didn't do much to boost the economy. Companies distributed repatriated cash to shareholders, not employees. High Income: If you have a very high income, the tax plan helps you the most. The Tax Foundation said those who earn more than 95% of the population would receive a 2.2% increase in after-tax income. Those in the 20% to 80% range would receive a 1.7% increase. The Tax Policy Center said those in bottom 20% would only receive a 0.4% increase. Large Families: You may be hurt by the elimination of personal exemptions. The higher credits for children and elderly dependents may not be enough to offset that loss. Homeowners: If take out a new home equity line of credit, you can only deduct the mortgage interest if you use it to buy or improve a home. If you take out a new mortgage or refinance an existing one, you can only deduct the interest up to the limit. If you live in a state with high property taxes, you can only deduct the first $10,000. Self-employed: If you are a 1099 contractor, own your own business, or are self-employed, you may benefit from the 20% deduction on qualified income. JPMorgan announced a $20 billion, five-year investment across its businesses. It would increase charity donations by 40% to $1.75 billion over five years. The increase in the standard deduction would benefit 6 million taxpayers. That's 47.5% of all tax filers, according to Evercore ISI. But for many income brackets, that won't offset lost deductions. The Trump tax cuts cost the government even more. The Act increases the deficit by $1 trillion over the next 10 years according to the Joint Committee on Taxation. It says the Act will increase growth by 0.7% annually, reducing some of the revenue loss from the $1.5 trillion in tax cuts. The Tax Foundation made a slightly different estimate. It said the Act will add almost $448 billion to the deficit over the next 10 years. The tax cuts themselves would cost $1.47 billion. But that's offset by $700 billion in growth and savings from eliminating the ACA mandate. The plan would boost gross domestic product by 1.7% a year. It would create 339,000 jobs and add 1.5% to wages. The U.S. Treasury reported that the bill would bring in $1.8 trillion in new revenue. It projected economic growth of 2.9% a year on average. The Treasury report is so optimistic because it assumes the rest of Trump's plans will be implemented. These include infrastructure spending, deregulation, and welfare reform. The JCT analysis is probably the most accurate since it only analyzes the cost of the tax cuts themselves. The tax cuts' increase to the debt means that budget-conscious Republicans have done an about-face. The party fought hard to pass sequestration. In 2011, some members even threatened to default on the debt rather than add to it. Now they say that the tax cuts would boost the economy so much that the additional revenues would offset the tax cuts. They ignore the reasons why Reaganomics would not work today. Increase in sovereign debt dampens economic growth in the long run. Investors see it as a tax increase on future generations. That's especially true if the ratio of debt-to-GDP is near 77%. That's the tipping point, according to a study by the World Bank. It found that every percentage point of debt above this level costs the country 1.7% in growth. The U.S. debt-to-GDP ratio was 104% before the tax cuts. Supply-side economics is the theory that says tax cuts increase growth. The U.S. Treasury Department analyzed the impact of the Bush tax cuts. It found that they provided a short-term boost in an economy that was already weak. Many large corporations confirmed they won't use the tax cuts to create jobs. Corporations are sitting on a record $2.3 trillion in cash reserves, double the level in 2001. The CEOs of Cisco, Pfizer, and Coca-Cola would instead use the extra cash to pay dividends to shareholders. The CEO of Amgen will use the proceeds to buy back shares of stock. In effect, the corporate tax cuts will boost stock prices but won't create jobs. On October 23, 2018, Trump proposed a new 10% tax cut focused on the middle class. But the plan fell apart after the mid-term elections. This article provides an overall summary. The Act is so complex that it affects each taxpayer differently. Consult a tax expert to determine the Act's impact on your personal situation. If you would like Congress to change the Act, then contact your U.S. Representatives and Senators and tell them.